This week on our way back to Baltimore, we bought some Rainier cherries in Washington State, not far from the Yakima Valley where they're grown. A week or so ago, I saw Rainier cherries in Baltimore for $6.99 a pound. I had four pounds in my cart. Then I thought, almost thirty dollars on cherries? really? I put them back. But the cherries we found in Washington, were not only fantastic in taste, but we got three pounds for eight bucks. That's only $2.66 a pound. What a deal! Maybe we need to get into the cherry hauling business. In this article, I learned all kinds of things about cherries. 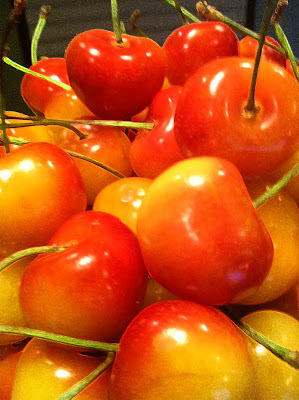 I learned that the Rainier cherry is the sweetest, prettiest and most pampered of cherries. And it's very temperamental; if the temperature gets to 90 degrees, the cherry loses a day of life. If it's too windy, the cherry gets brusied from hitting the other cherries. If it rains more than one day, the cherry busts its skin. I learned that one third of a Rainier cherry orchard's crop is eaten by birds (lucky birds). I learned that people in Japan are willing to pay more than one dollar PER cherry for Rainiers. Maybe we need to get into the cherry export business. I learned that the Rainier was bred, it didn't occur naturally. Harold Fogle, who was the director of the cherry breeding program (who knew there was such a thing?) at Washington State University in Prosser, WA created this cherry in 1952. It's a cross between a Bing cherry and a Van cherry, which are two sweet varieties. And sweet they were. Like little sugar bombs. Who ever knew that I'd get to know so much about cherries, Rainier or not. All I remember from my youth, was my father handpicking the cherries in the grocery store, getting all the plump, firm, dark red ones. They were the sweetest. Seems good cherry pickin' is in my blood. 2 YEARS AGO: Where Is Robin Hood When You Need Him? All the cherries we got this year were crap. Seems that the East coast gets all of the third class fruit these days.